The world is buzzing about how Southeast Asia has been roasting in an extended heatwave as El Niño has caused temperatures to soar to record-breaking highs on April of 2016. Meanwhile, in the United States, weather forecasters predict that summer temperature in the northern half of the country will be "much above average." While air-conditioners may cool the body, they will not replenish lost fluids. Scientists advise that in extremely hot weather, everyone should drink plenty of fluids to stay hydrated. What kind? Water is, of course, the best option. But coffee, tea and sodas — caffeine-rich diuretics that have long been considered more harmful than beneficial for people to want to rehydrate — may help rehydrate so long as they are consumed in moderation. What about juices, shakes, slushies and smoothies? They are delicious and, yes, they will help keep you hydrated. Here are eight ideas to consider for your next smoothie, milkshake or slushie. Every one of these drinks include an ingredient native to Southeast Asia that are exported to many parts of the world. For best results, chill the fruits before pureeing. When ice is needed, use crushed ice to minimize any chance of the blender's pitcher cracking or the motor overworking. Dragonfruit is a kind of cactus that grows in Southeast Asia, Mexico, Central and South America. There's white dragonfruit and there's magenta dragonfruit, but both have magenta skins. There's also a yellow-skinned dragonfruit with white flesh. 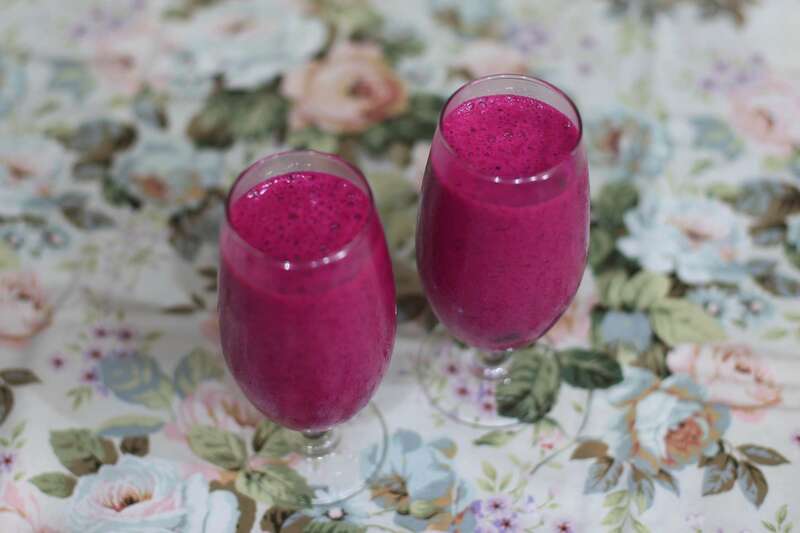 The taste varies with each type (white dragonfruit is a bit tangy while the type with magenta flesh tastes earthy and leaves a not-unpleasant aftertaste) but all types can be made into a delicious smoothie or a milkshake. To make dragonfruit milkshake for two, cut off the skins of the fruit and dice the flesh. Put the diced dragonfruit in the blender's pitcher, add one to one-and-a-half cups of very cold milk and about a quarter cup of crushed ice. Process until smooth. Taste. If you feel that the drink needs sweetening, add a tablespoonful or two of sugar. Process for another ten seconds to blend. What's so good about mango and applesauce milkshake? The tang from the lemon juice in the applesauce and the earthiness of the cinnamon in it go wonderfully with the sweetness of the mangoes. Ripe mangoes are naturally sweet and commercial (and homemade) applesauce contains sugar. When you combine these two to make a milkshake, there's hardly any need to add sweetener. To make mango and applesauce milkshake for two, use two ripe mangoes. Stand the mango vertically and cut off both sides as closely as you can to the stone in the middle. Discard the stones. Scoop out the mango flesh and dice. Puree the mangoes in the blender. Using the measuring guide embossed on the blender's pitcher, add as much applesauce to equal the amount of pureed mangoes. Pour in a cup of cold milk. Pulse a few times to blend well. Peanut butter and banana smoothie tastes good; Nutella and banana milkshake is the bomb. It's all that chocolate... When did chocolate not make anything taste better? To make Nutella and banana milkshake for two, start with two ripe bananas. Peel and dice them and toss them into the blender. Pour in a cup of very cold milk and puree. Measure four heaping tablespoonfuls of Nutella and add to the banana and milk mixture. Process until the Nutella is fully incorporated and no light and dark streaks are visible in the mixture. Pour the milkshake into glasses and sprinkle with cocoa powder before serving. If you've never tried including cucumber in your drink, now is the perfect time to do so. Cucumber contains a lot of water and is naturally sweet. When combined with the sweet and creamy avocado, the result is a drink that looks and tastes like milkshake but has actually no milk in it. To cut the sweetness (avocado and cucumber can be cloying), throw in something tangy like blueberries. To make cucumber, blueberries and avocado smoothie for two to three persons, you will need one whole cucumber and one whole ripe avocado. How much blueberries you will need to add depends on how much contrast you're aiming for. Some people like their drinks ultra sweet while others prefer more tang. Cucumber skin is edible so there is no need to peel the cucumber. If you prefer to peel it anyway, do it. The skin is not crucial in making this drink. What is crucial is that you cut the cucumber in half and scoop out the seeds. You don't want them in your drink. Dice the cucumber flesh and put in the blender's pitcher. Cut the avocado, remove and discard the stone, then scoop out and dice the flesh. Add to the cucumber. Pour in a quarter cup of ice-cold water and process to make a puree. Uncover the pitcher and add a quarter cup of blueberries. Put the cover back on and process until smooth. Taste the smoothie. If you want more tang in it, add another quarter cup of blueberries and process again until smooth. Inspired by maiz con hielo, a cold snack in the Philippines made with sweet corn kernels, milk, ice and sugar, this sweet corn milkshake can be made with canned corn kernels or with an ear of fresh sweet corn. If using canned corn kernels, just process the corn, milk and ice together, and the drink is done. If using fresh corn, cook it first by steaming or simmering in water. Cool then use a box grater to get the kernels and as much of the creamy juices as you can. When you've removed all the kernels, use a spoon to press out any remaining juices on the cob. Then, process the corn and juices in the blender with cold milk and ice until smooth. Sugar or some other sweetener is optional if the corn that you used, canned or fresh, is sweet enough. Another drink with cucumber in it, this super refreshing smoothie has kiwi and honeydew too. There are several types of kiwi fruit and they don't all taste the same. From experience, the sweetest is the variety with golden flesh. If you use that kind of kiwi fruit, adding sugar to this drink will be totally unnecessary. However, if your kiwi is more tart than sweet, you will need to add a little sugar to balance the tartness. You won't be using a whole honeydew to make smoothie for three to four people. Take your honeydew and cut in half. Keep one portion in the fridge. Take the other portion, scoop out and discard the seeds. Cut the honeydew into wedges. Take a wedge and run a think knife between the flesh and skin to separate them Discard the skin. Dice the flesh. Do the same with the rest of the honeydew wedges. Take three kiwis, cut in half and scoop out the flesh. Dice. Take a cucumber (peel it or don't), split, scoop out the seeds and discard. Dice the flesh. Put everything in the blender. Add a little water and crushed ice. Process until smooth. Taste. If too tart, add sugar and process again to blend. A combination that I discovered while inspecting the contents of the fridge and wondering what bits and pieces could be put to good use. As it turned out, a handful of strawberries, a few slices of melon and some bits of pineapple were the perfect ingredients to make a glorious smoothie. The melon in this smoothie is cantaloupe — the type with orange flesh and skin that looks like a web. You may use other varieties of melon like honeydew, very young winter melon or seedless watermelon but definitely not bitter melon. Take half of a melon, scoop out and discard the seeds. Cut the melon into wedges. Run a thin knife between the flesh and the skin to separate them. Discard the skin. Dice the flesh. Hull about ten medium-sized strawberries and cut each into halves. Dice enough fresh pineapple to measure one cup. Put the melon, strawberries and pineapple in the blender with about a quarter cup of crushed ice and an equal amount of water. Process until smooth. You'll have enough for three to four large glasses of smoothie. Soursop is sour, creamy and delicious. But you have to painstakingly remove the seeds and there are many of them. It's worth the trouble though because this drink is absolutely delicious. Measure enough deseeded soursop to measure half a cup. Roughly chop and put in the blender's pitcher. Take one young coconut — not the kind that you squeeze to get coconut milk but a really young coconut with flesh so soft and thin that you can see the husk through it. Split coconut and save the water. Using a spoon, scoop out the coconut flesh. Do this gently so as not to scrape the husk. You don't want to include any of the husk in your drink. Add the coconut flesh and water to the soursop in the pitcher. Add half a cup of crushed ice as well. Process until smooth. And the part that really gives this drink a wonderful freshness... spearmint leaves. Take about six large spearmint leaves, tear them up, add to the smoothie and pulse a few times to break them up. Just pulse. Don't process for too long because mint leaves are very delicate and over-processing will make them lose their flavor. So, pulse a few times. Pour the soursop and coconut smoothie into three to four glasses and, optionally, garnish with sprigs of spearmint.